Hello everyone! 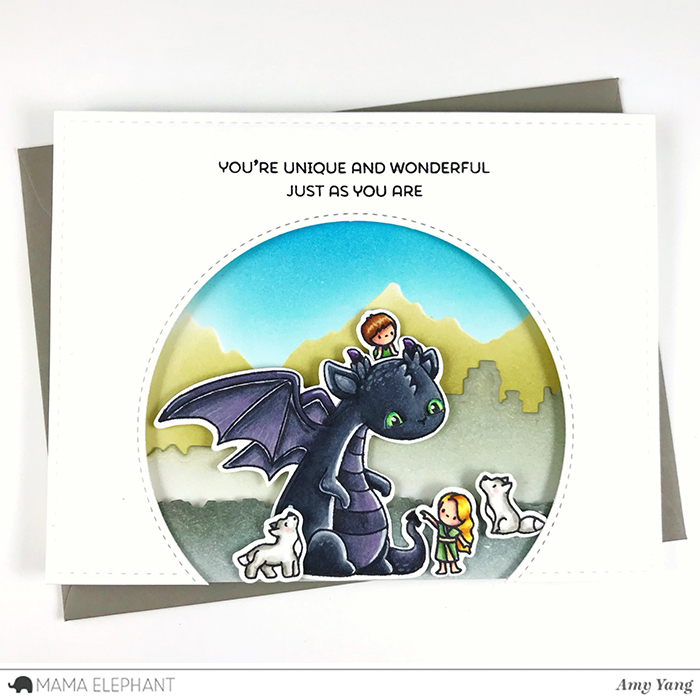 Amy here with a Designer Series project featuring the Me And My Dragon stamp set and Kingdom Trio Creative Cuts. For today, I created a card with a masculine color scheme for the men and boys out there that love dragons as much as we do. To begin, I stamped the images from Me And My Dragon and colored them with Copic markers. I made the eyes of the dragon bigger to give him a different look. I was inspired by Toothless from How to Train Your Dragon. I used a white gel pens to add details and highlights on the dragon. After, I cut out the images with Me And My Dragon - Creative Cuts. Then, I worked on making different panels for my card using the Kingdom Trio Creative Cuts. First, I trimmed Bristol paper to an A2 sized panel to make the background. I die-cut masking paper with the mountain die. I covered the mountain with the masking paper and used it to ink blend the sky with Peacock Feathers and Salty Ocean Distress Inks. Then, I covered the sky and ink blended the mountain with Peeled Paint and Antique Linen. Next, I die-cut trimmed Bristol paper (making them about 4 3/4" wide because I'll be adding the front panel with foam tape later on) with the city and the ground die. I ink blended the city with Iced Spruce and little bit of Peeled Paint, and the ground with Iced Spruce and little bit of Black Soot Distress Inks. I adhered the city to the mountain and mounted the ground on top of the the city with foam tape. To create my front panel, I die-cut white cardstock with the big frame die from Peek A Frame - Creative Cuts and then with the largest circle die from Basic Circles -Creative Cuts. Please note: in the photo above I die-cut the circle slightly off center, but in my final project the circle is in the middle of the card. I stamped the sentiment with black dye ink from Dragon Wishes as shown. Then, I mounted the front panel to the background panel with two layers of foam tape. To finish, I adhered the images with foam tape as well. Thank you so much for stopping by! Happy cardmaking! Love this card! That is the movie i first thought of when this set came out! Thanks for sharing. It is a wonderful card! What a lovely card! Beautiful coloring as always! What a cute card ! Adore this!! This is outstanding. This card is so adorable! I love the background and the coloring on the dragon.